This is the third installment of my vandrestav journey this summer, 2011. 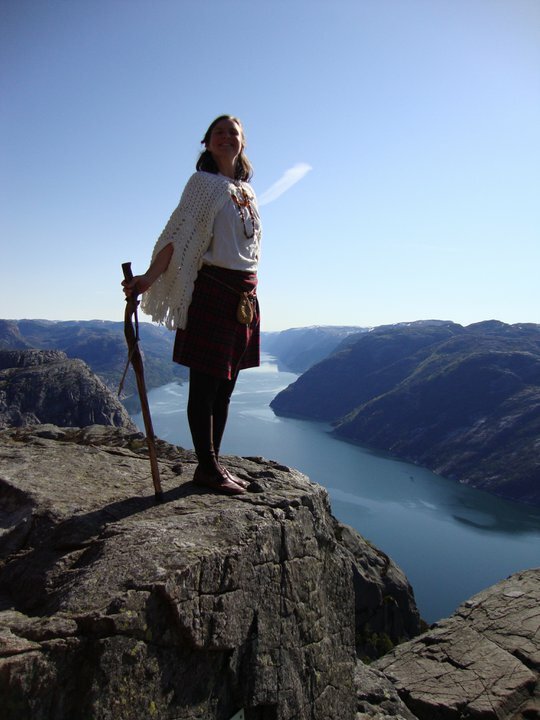 The first two events, Trothmoot and Northern Folk Gathering, were specifically designed for practitioners of the spirituality of the Northern European folk tradition. The Midwest Viking Festival, which took place July 16 – 17, was a celebration of specifically Viking era traditions, attracting Scandinavians looking for deeper root connections as well as public from many other cultures seeking to learn more about their Scandinavian American neighbors. Though not strictly a “Viking re-enactment camp,” education and context for the learning was achieved through historical re-enactment. For the prior two events, I was invited to teach volva stav, my own contemporary expression of the volva, staff carrier of Northern European spiritual tradition. I performed from my wide repertoire of songs and stories that connect the listener to my own ancestral journey, healing oorlag and honoring disr (female ancestor guides). For the two prior events, my perspective of living in the here and now on this pathway was the source of my involvement in the events. At the Midwest Viking Festival I am hosted by the temporary Viking village as a “holy woman” who “sings from her staff.” It is the only “re-enactment” style event that I participate in, since I am not re-enacting beliefs of my foremothers but rather taking up their work as a European American. Why do I do this event? As with the two prior events, I hail the hosts. The Historical and Cultural Society of Clay County sponsors this event. Through grant writing and volunteerism they have made it possible for the roots of Northern European cculture to have expression. Tim Jorgensen, the coordinator of the event, honors me as a contemporary volva and creates an environment where the diversity of beliefs during the Viking era can be explored and the historical precedence for bridging Heathen and Christian beliefs can provide lessons for this same dilemma in contemporary culture. At this event I know I will be sharing my history with a public that might be very surprised to learn how honored wise women were in the Viking Era and before. I will be educating the wider public about how intricate indigenous European cosmology, numerology and metaphysics are and how this world view manifests itself in the lore, folk songs of my Immigrant ancestors and in my work as volva today. I also know that those “villagers” and public who need the assistance of a modern day volva will feel safe to ask for my help. They count on my visit each year as they may not be in contact with a volva until I come again the next year. It can be difficult for cultural preservation organizations to honor the total reality of the culture they represent. Spirituality is at the root of all things produced by culture. Songs, dances, stories, jewelry designs, fabric weaves, wood carvings, and even fighting styles are imbued with the spiritual content of the cultural mindset. I see this at pow wows and Hmong festivals, and within the comparative analysis of the public who comes from a wide range of cultural traditions to learn something new at the Midwest Viking Festival. It feels wonderful to be an honored part of a festival that doesn’t shy away from total cultural expression. This commitment can be seen in all of the local heritages celebrated through the Historical and Cultural Society of Clay County. First Nation peoples, African Americans, and recent immigrants from Latin America are among the cultures being explored, preserved, nourished and honored through this fine institution. I would encourage readers to make a trip or donate to HCS of Clay County, to participate in the hard work the Historical and Cultural Society is doing for all of humanity!